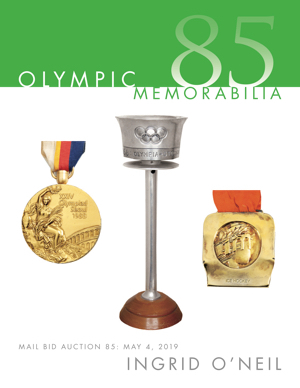 Front Cover (Lots 1, 24, 23) Lot 1 Stockholm Equestrian Olympic Games Torch, 1956; Lot 24 Gold First Place Winner’s Medal Awarded for an Equestrian Event in the 1988 Seoul Olympic Games; Lot 23 Gold First Place Winner’s Medal Awarded for Ice Hockey in the 1984 Sarajevo Olympic Winter Games. First African Olympic Games in Alexandria 1929 Badge (enlarged). (Pages 1 - 4) Title Page, Terms of Sale; Highlights of the Auction, Official Torch of the Stockholm 1956 Equestrian Olympic Games. (Pages 5 - 8) Highlights of the Auction (continued). Highlights of the Auction (continued); IOC Pins Presented to Olympic Winners and Participants. IOC Pins Presented to Olympic Winners and Participants (continued); Second National Greek Olympic Games, Athens, 1870; Third National Greek Olympic Games, Athens, 1875; Athens, 1st Olympic Games, 1896; Paris, 2nd Olympic Games, 1900; St. Louis, 3rd Olympic Games, 1904; London, 4th Olympic Games, 1908; Stockholm, 5th Olympic Games, 1912; Antwerp, 7th Olympic Games, 1920; Chamonix, 1st Olympic Winter Games, 1924..
Paris, 8th Olympic Games, 1924; St. Moritz, 2nd Olympic Winter Games, 1928; Amsterdam, 9th Olympic Games, 1928. Amsterdam, 9th Olympic Games, 1928 (continued); Lake Placid, 3rd Olympic Winter Games, 1932; Los Angeles, 10th Olympic Games, 1932; Garmisch-Partenkirchen, 4th Olympic Winter Games, 1936; Berlin, 11th Olympic Games, 1936. Tokyo, 12th Olympic Games, 1940 (Cancelled); Helsinki, 12th Olympic Games, 1940 (Cancelled); Cortina d' Ampezzo, 5th Olympic Winter Games, 1944 (Cancelled); St. Moritz, 5th Olympic Winter Games, 1948; London, 14th Olympic Games, 1948; Oslo, 6th Olympic Winter Games, 1952; Helsinki, 15th Olympic Games, 1952; Cortina d' Ampezzo, 7th Olympic Winter Games,1956; Stockholm, 16th Equestrian Olympic Games,1956; Squaw Valley, 8th Olympic Winter Games, 1960. Squaw Valley, 8th Olympic Winter Games, 1960 (continued); Rome, 17th Olympic Games, 1960; Innsbruck, 9th Olympic Winter Games, 1964; Tokyo, 18th Olympic Games, 1964; Grenoble, 10th Olympic Winter Games, 1968; Mexico City, 19th Olympic Games, 1968; Sapporo, 11th Olympic Winter Games, 1972. Sapporo, 11th Olympic Winter Games, 1972 (continued); Munich, 20th Olympic Games, 1972; Innsbruck, 12th Olympic Winter Games, 1976; Montreal, 21st Olympic Games 1976; Lake Placid, 13th Olympic Winter Games, 1980; Moscow, 22nd Olympic Games, 1980; Los Angeles, 23rd Olympic Games, 1984; Calgary, 15th Olympic Winter Games, 1988; Seoul, 24th Olympic Games, 1988. Seoul, 24th Olympic Games, 1988 (continued); Albertville, 16th Olympic Winter Games, 1992; Barcelona, 25th Olympic Games, 1992; Lillehammer, 17th Olympic Winter Games, 1994; Atlanta, 26h Olympic Games, 1996; Nagano, 18th Olympic Winter Games, 1998; Sydney, 27th Olympic Games, 2000; Salt Lake, City, 19th Olympic Winter Games, 2002; Tornina, 20th Olympic Winter Games, 2006; London, 30 Olympic Games, 2012; Sochi, 22nd Olympic Winter Games, 2014. Sochi, 22nd Olympic Winter Games, 2014 (continued); Rio de Janeiro, 31st Olympic Games, 2016; Pyeongchang, 23rd Olympic Winter Games, 2018. Gold First Place Winner’s Medal of the 1936 Garmisch-Partenkirchen Olympic Winter Games. Our PDF catalogs require the Adobe Acrobat Viewer.